HDD, SSD, or SSHD? Which one should you get on your next laptop? The laptops of today come with multiple storage options. What are they, and which one is right for you? Read on to find out. Choosing a storage option while buying a new laptop isn't what it once used to be. Even in laptops sold as recently as six years ago, the capacity was all that the buyer had to choose. HDDs have been used in computers for a very long time now. They work by using magnetic platters that spin at a high speed. Each platter is divided into tracks and sectors, and data is retrieved from and written into these divided areas of the platter using a pivoting read/write head. Because HDDs are made and sold in such huge quantities, they're relatively inexpensive. Moreover, they have a good lifespan in terms of read/write cycles, and are high on capacity. HDD options on laptops these days begin from a modest 500GB and go up to a planet-sized 6TB. The physical design of HDDs is the cause of some critical drawbacks. Because HDDs use moving parts inside them, they're relatively slow in accessing data. They're also prone to damage from physcial shock, thereby increasing their chances of failure. They consume a considerable amount of power during operation. They're also heavier and larger. Although SSDs have existed in computers from a time as early as 1991, their presence in everyday laptop models is a recent phenomenon. They work by using non-volatile 'flash' memory chips to store and retrieve data. Unlike HDDs, they employ no moving parts inside them. Since SSDs have no moving parts, their chances of failure are lower, making them more reliable for laptops constantly on the move. For the same reason, they are also lighter and more power-efficient, which means you can expect your laptop to be a little lighter as well, and its battery to last longer. Sadly, they're also more expensive. SSDs are available in three form factors: the traditional 2.5-inch form factor (same size as HDDs), the smaller mSATA form factor, and the even smaller M.2 form factor. SSDs on laptops can use one of two data transfer protocols: AHCI (Advanced Host Controller Interface), a long-standing protocol that works with SATA-based SSDs and HDDS; or NVMe (Non-Volatile Memory Express), a newer, more advanced protocol designed specifically for non-volatile memory like SSDs. The latter is expensive, but is considered the future of SSDs. You guessed it—SSHDs combine an SSD and an HDD to give the user the best of both worlds. They use a standard-capacity HDD for storing data of all types along with a small SSD for quick access to frequently accessed data. A controller chip on the SSHD decides which data gets stored on the SSD and which data gets pushed to the HDD. While SSHDs can be viewed as a good upgrade over HDDs, they can never be seen as an upgrade over SSDs in terms of performance. SSHDs gain some of the speed benefit of SSDs but contain an HDD in them at the end of the day. This means they're still subject to the drawbacks of an HDD. They're prone to damage due to physical shocks. They're slower, consume more power, and weigh more. SSHDs in general can be looked at as an improvement over typical HDDs. In terms of cost, SSHDs fall between HDDs and SSDs. Therefore, laptops featuring an SSHD can be expected to cost somewhere in the middle of laptops featuring an HDD and laptops featuring an SSD. 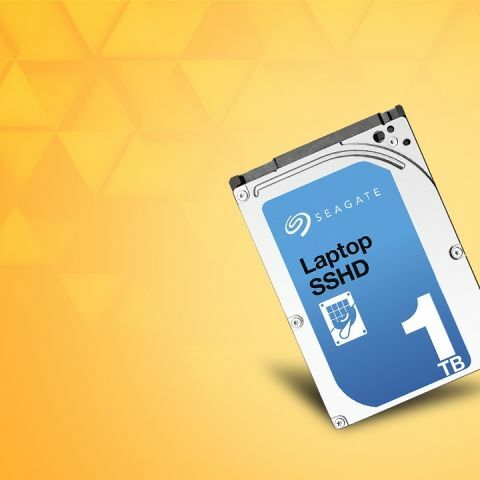 Many gaming laptops these days feature both an M.2 SSD and a standard 2.5-inch HDD and use them simultaneously so large game files can be stored on the larger HDD and be pushed to the smaller but quicker SSD when a game is launched. Intel's new technology, christened Optane, is an M.2 memory module that acts as a bridge between the two and increases overall storage performance by 28 percent. To take advantage of the Intel Optane technology, the laptop must have a seventh-generation Intel Core-series CPU or later installed on an Optane-compatible motherboard. Look for the words 'Intel Optane' on the spec sheet of your next laptop. If high storage capacity for low cost is the be-all and end-all of your new laptop, then consider a model with an HDD. 1TB and 2TB are the most common options in laptops these days. If you think you could do with a faster HDD, then consider a model that features an SSHD. If performance is most crucial for you and capacity or cost doesn't matter too much to you, then consider a model with an SSD. Look for a laptop with an NVMe-supported SSD if you want the best storage option out there. For more laptop buying guides, check out our Back to College microsite here. Which Should i buy? One plus one or Xiomi mi4? Which of the two is the better choice, an SSD or HDD? Can both be used seamlessly ?